Ok, so you have someone's birthday coming up and you have no clue what to get him or her? 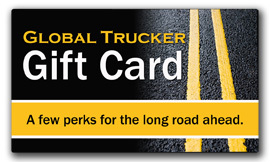 It's easy... get a Global Trucker gift card! This gift card has NO EXPIRATION DATE! With plenty of items to choose from, ranging from 12 volt accessories to golf merchandise to sports gear, your gift recipient should have no trouble finding something he or she likes or needs. Gift cards are great anytime of the year, so pick yours up today!